DIVERSIFIED group YTL Corp Bhd is optimistic of better years ahead, helped by the recovery of the property market, its wireless broadband business, as well as its other businesses. 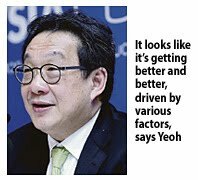 "For the full year results (ending June 30 2010), the absolute sum will be double that of our first-half numbers," said group managing director Tan Sri Francis Yeoh on the sidelines of Invest Malaysia in Kuala Lumpur yesterday. "For the next financial year, it looks like it's getting better and better, driven by various factors ... WiMAX, property ... everything is moving," he added. YTL Corp posted a net profit of RM423.7 million on revenue of RM7.9 billion for the first half ended December 31 2009. It also plans to launch its wireless broadband services at the end of this year, which the group has committed to invest RM2.5 billion over the next five years. Meanwhile, Yeoh said the group will use the US$350 million (RM1.1 billion) raised via a five-year exchangable bonds to build its war chest. "We always make sure we have a war chest," he said, without giving details on what companies or sectors he is eyeing. Malaysian Resources Corp (MRCB) is a “potential beneficiary” from a plan by the government and the Employees Provident Fund to form a venture to promote the development of 3,000 acres of land outside Kuala Lumpur, HwangDBS Vickers Research Sdn Bhd said in a report today. The stock, controlled by the Employees Provident Fund, climbed 3.8 per cent to RM1.65 at 9.51 am Malaysia time, set for its highest close since March 7, 2008. Meanwhile, chief executive officer Mohamed Razeek Hussain Mericar said Malaysian Resources wants to participate in the development of 3,000 acres of government land in Sungai Buloh, outside Kuala Lumpur. The comment comes after Prime Minister Datuk Seri Najib Razak said yesterday that the government and the Employees Provident Fund, the biggest shareholder of Malaysian Resources, will form a joint venture to promote the development of the land. GCH Retail (Malaysia) Sdn Bhd, which operates the Giant, Guardian and Cold Storage outlets, has signed a 15-year tenancy deal with Naim Realty (Malaysia) Sdn Bhd to open its second hypermarket in Sarawak. Naim Realty is a wholly-owned subsidiary of Naim Holdings Bhd. The proposed Giant hypermarket located in Miri, will be completed by mid-July next year and is expected to create more than 200 jobs after it's opened. "We have invested more than RM12 million in the Giant Permy Mall, a two-storey shopping mall with a gross floor area of 269,000 sq ft over 8.5 acres (3.44ha)," said GCH Retail chief operating officer Tom Herriott after the signing ceremony in Kuala Lumpur yesterday. The event was witnessed by Miri City Council mayor Lawrence Y.S. Lai. He said the hypermarket in Miri is the second after Sibu in Sarawak, which is slated to be operational by next year. 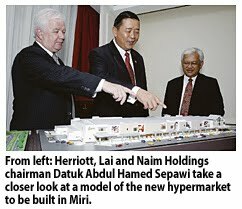 "We are also looking at building a third hypermarket in Kuching and are presently scouting for the right location," Herriott said. The new hypermarket in Miri is located within Naim Realty's Bandar Baru Permyjaya development, which has a population of 50,000. There are 121 Giant hypermarkets throughout Malaysia today.